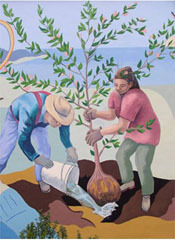 Sanchez Art Center opens its 2008 exhibitions with Bay Area artist John Toki in the Main Gallery. Toki is a self-described landscape sculptor who builds towering, monolithic forms and sculptural murals from clay and porcelain. He will exhibit his most recent works in an exhibit titled Echoes of the Earth. 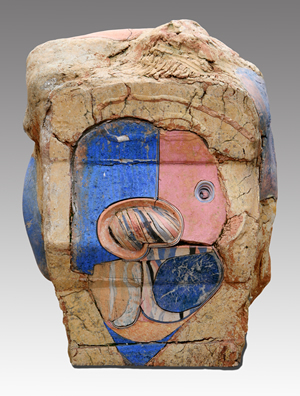 These are freestanding and wall-mounted sculptures with striations of lapis blue, yellow, pink, and rich tonal gradations of color made from porcelain. The linear forms and oblong shapes re-create the prolific patterns found in nature and reflect Toki’s contemplative and aesthetic sensibility. Born into a Bay Area family that savored the rich Japanese tradition of ceramics, Toki integrates both Western and Eastern ceramic styles. The natural world of the Bay Area region is his point of departure for his earthen forms. Toki will give an Artist’s Talk on Sunday, January 27, from 2 to 4 pm. He will teach a Ceramic Mural Workshop on Sunday, February 10, from 9 to 5 pm at the Art Center.